If you follow health bloggers and trends online, you've probably seen claims that lemon juice is the missing link between you and your dream body. While there are a number of weight-loss claims surrounding lemon, from regulating sugar absorption to melting the fat away, there's not enough science to support them. However, lemon juice offers other benefits that you might find useful when you're trying to lose weight. Consult your doctor to discuss diet and weight loss before making changes to what you eat or your exercise program. One study has linked lemons to weight reduction -- not the juice specifically but lemon polyphenols found in the peel of the lemon. This 2008 study published in the Journal of Clinical Biochemistry investigated the effects of these lemon polyphenols on obesity and fat metabolism in mice fed a high-fat diet. This study found that the lemon polyphenols were effective at suppressing weight gain and fat gain in the mice. While this study shows some promise, there are a couple of things to note. First, the polyphenols may help the mice, but it's not known if they'll have the same effect on you and your weight. Human studies need to be conducted before claims are made. Also, most of the polyphenols in the lemon are found in the peel, and you may not get enough polyphenols in the juice to help you lose the weight. When you're trying to lose weight, every calorie counts. 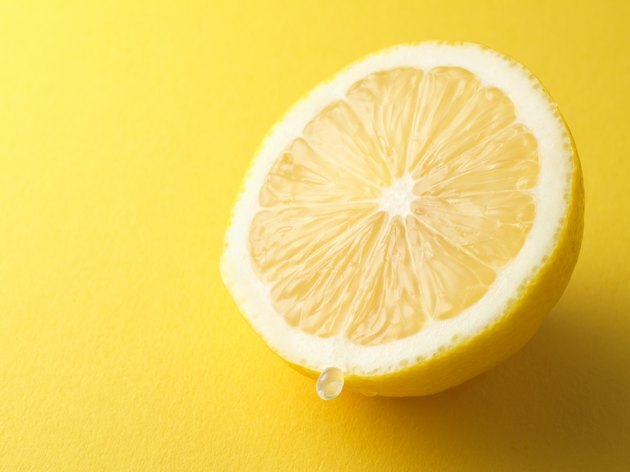 Lemon juice may not magically melt your fat away, but as a low-calorie flavor enhancer, it can help you save calories to support your weight-loss efforts. The juice from one lemon, which yields a little more than 3 tablespoons, has only 11 calories. Instead of adding heavy high-calorie sauces to your food, squeeze lemon on your fish, chicken, cooked veggies, salad greens or grain dishes to add flavor and help you reduce your overall calorie intake to lose weight. Lemon juice is also sodium-free and can help you limit sodium intake as well. In addition to diet, exercise is an important part of the weight-loss equation. When you're carrying around extra weight, exercise may be difficult, and you may find yourself losing your breath quickly, which may discourage you from working out. There is a link between vitamin C and fatigue, according to a 2013 study published in Nutrition. This study investigated the effects of vitamin C supplementation on exercise tolerance in a group of obese people and found that the vitamin C positively influenced the feelings of fatigue, as well as overall exercise tolerance, in the group of participants. Lemon juice is an excellent source of vitamin C, with the juice of one lemon meeting about a third of the daily value. If you're exercising and having a difficult time, the vitamin C in lemon juice may give you a boost. It's important to note, however, that the group in the study was supplemented with a much higher dose of vitamin C than what's in the juice. Food Network: Ask the Dietitian: Does Lemon Juice Speed Up Weight Loss? BBC Food: Fruit Peel: Should We Be Eating More?